4 more days until freedom. Finals season is such a ridiculously draining time of the year – and I swear, it’s absolutely drained me of Christmas spirit. On the outside, I’m trying to appear composed and joyful about the holiday season… but on the inside? I imagine this is what it feels like for a monster to bathe in holy water. I’m also pretty sure that this is the kind of torment my cat feels when we give him a bath. I think I might actually hate babies after this course. You guys have no idea how jealous I am of Nugget when he comes and shows me some moral support but sleeping on my bed while I study. How great would it be to be a cat?! All you do is eat, sleep, chase things, and get hugged. Life isn’t fair sometimes eh? Well anyways, I continued my search for the perfect cookie during one of my periods of procrastination this week and came across this recipe. 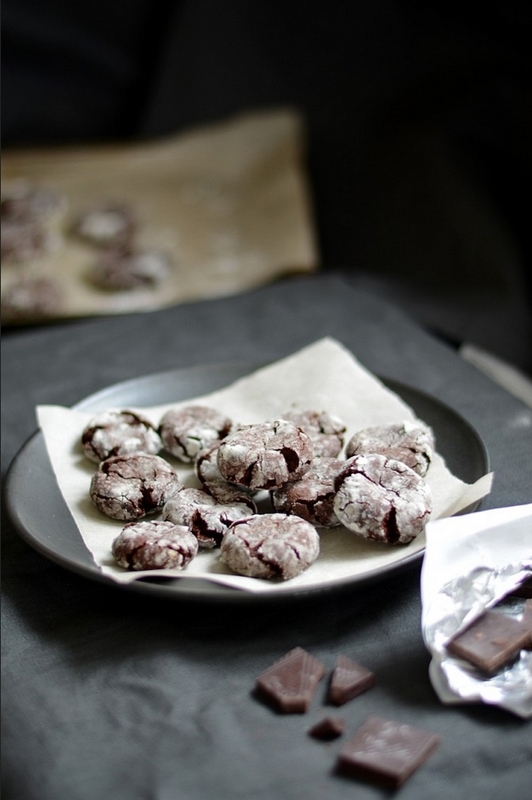 There’s something so beautiful about crinkle cookies, don’t you think? They’re such an awesome example of “rustic” beauty, and they just have this elegance about them that’s perfectly balanced with a hint of childhood nostalgia. When you “undercook” these guys slightly, they come out like a cross between a cookie and a brownie, and if that isn’t heavenly divinity then I don’t know what is. 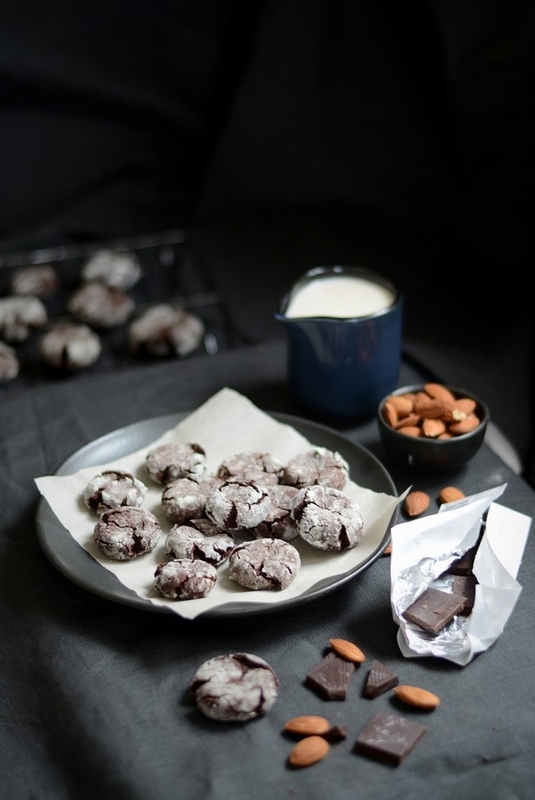 Yes, imagine the lovechild between a magical, crumbly cookie and the ooey gooey warmth of a chocolatey brownie. The second I put one in my mouth to try, I swear I heard Joy to the World and saw angels and snowflakes. Cookie perfection. 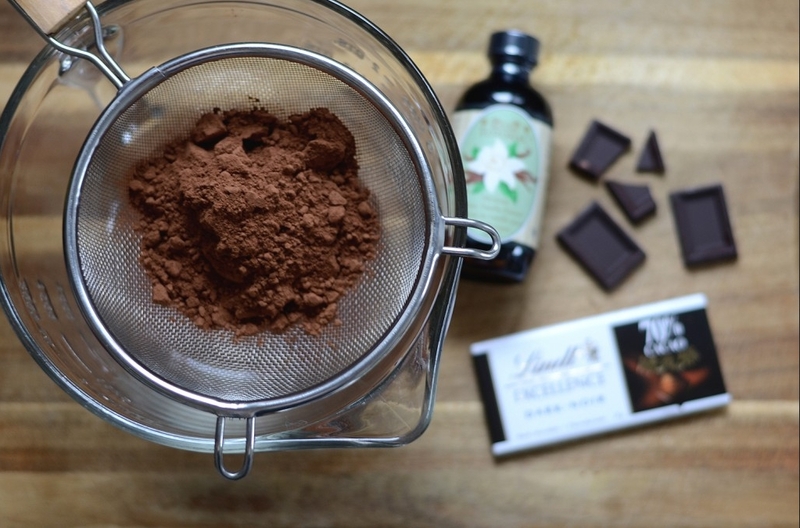 I adapted a recipe I found from the flawless miss Carla Hall from Top Chef/the Chew, by adding more chocolate, and a little bit of this and that. The only thing about these cookies is that because of the increased amounts of chocolate, they don’t spread that well by themselves. So you gotta take a spoon when they’re fresh out of the oven, and give them a little push to make them crack in all the right places. I didn’t know this when I put the first batch in the oven and I sat there wondering why they haven’t spread even after like 20 minutes when the bake time was supposed to be 8-12 minutes. But at least I’ve made the mistakes for you, so you don’t have to do the same. One of my favourite things about working with chocolate is watching how it just takes over the paleness of the flour, sugar, and eggs and turns it into the most gorgeous, deep chestnut colour. There’s such beauty in the art and chemistry of baking sometimes. As the queen (Nigella Lawson) says: “Sooner or later, everything gives way to chocolate. Which is after all, the natural order of things” and damn is she ever right. Man, these cookies with a glass of milk by the fire and Christmas tree is all you need on a cold winter’s night to fill you up with holiday cheer. But I mean, a glass of wine and a few Christmas classics wouldn’t hurt either. My mom liked these cookies so much that she took it upon herself to share them with the world without even consulting me. I came home from work a few days ago and thought my dad got the case of the munchies or something, but it turns out my mom had distributed them to all her friends and work neighbours. Her response when I asked her why she did it without even asking me? “Well it’s not like you’d have eaten them yourself. Eating things with flour and white sugar is a treacherous sin in your books.” Proof that my mom knows me a bit too well? Yep. 3. Once cooled, whisk in the egg, vanilla, salt, and the white & brown sugar until well incorporated. 4. Sift together the cocoa powder and flour and slowly mix in the chocolate mixture. 5. When you’ve got a good dough going on, roll out small balls using a teaspoon for a measure. I would say that make them about 1″ in diameter, max. 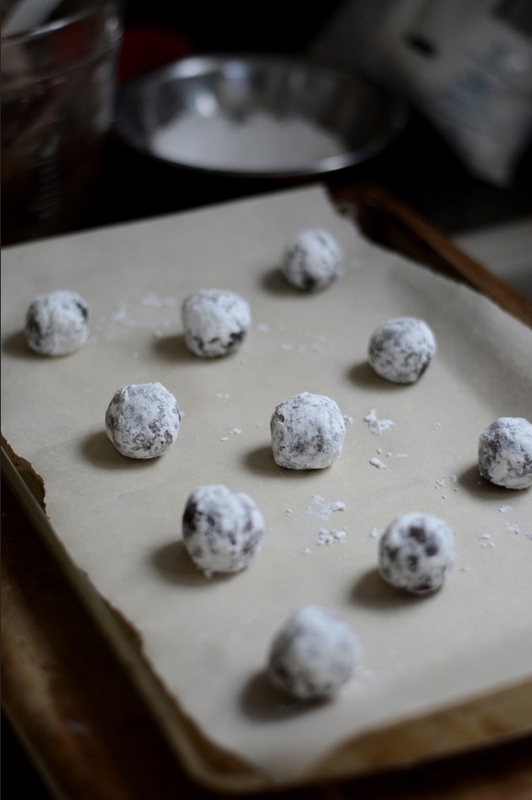 Roll them in powdered sugar until they are WELL COVERED before placing them on a cookie sheet. 6. Bake them for about 10-12 minutes. The less you bake them, the more ooey and gooey they are. The SECOND they come out of the oven, take a spoon and gently press down on them to make them crack and spread out. They crack a little in the oven, but they need a little push to get them flat! 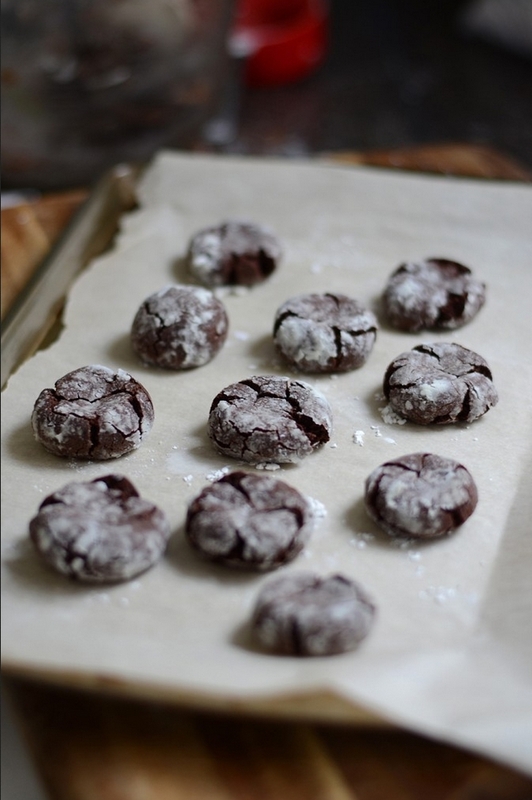 Let them cool for a bit, take a bit, and do a little cookie dance! Let me know how they turn out!